The cucumbers are practically popping out of the soil at Sophia Garden these days. 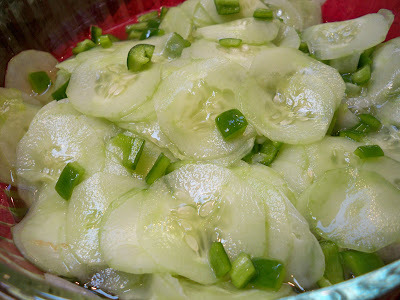 For this Marinated Cucumber Salad, the garden-fresh cucumbers are sliced paper-thin, tossed with slices of organic onions and diced green pepper, and dressed in a sweet-and-sour marinate that consists of 1/3 cup granulated sugar, 1/3 cup rice vinegar and 1 teaspoon of Kosher salt. Chill overnight for a refreshing and savory bite of summer! While I take a brief holiday from blogging, I’m offering up a tasting menu of some of my creations from the organic produce grown at Sophia Garden. Enjoy the bounty of summer, and I’ll be back soon. I love simple salads like this. Sometimes I might toss in a few red pepper flakes, to take this in a different direction. I hope you're having a real vacation and not just a vacation from blogging! This sounds just like a cucumber salad my mother used to make, delicious! I love dishes like this, where the taste isn't masked but rather enhanced. So simple and summery! Hope you're enjoying a last fling with summer this labor day weekend! I don't know what is about simple cucumber salads, but I never tire of them.